The sun-soaked Gold Coast has so much to offer when it comes to beautiful weddings. From beachfront venues overlooking the ocean, to wide open spaces surrounded by the hinterland, we’ve been lucky enough to work on some seriously unforgettable Gold Coast weddings in our time. If you’re currently planning your wedding here on the East Coast and hunting for some modern Gold Coast wedding inspiration, we’ve rounded up a few of our favourite recent setups for you below. From romantic garden weddings to poolside cocktail parties, keep reading for 6 real Gold Coast weddings and our top tips to recreate each look! 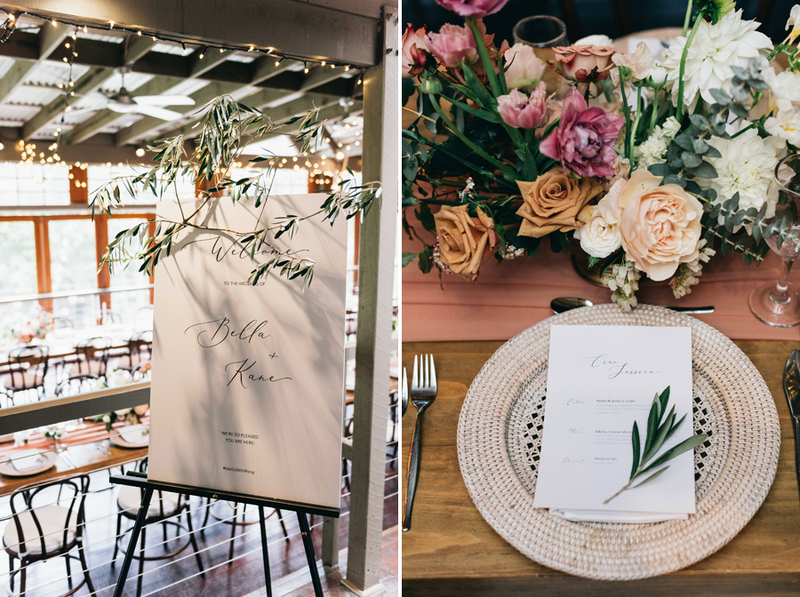 It was all about soft, romantic vibes at Bella and Kane’s dreamy garden wedding at Ecostudio Fellini in Mudgeeraba. From their intimate forest ceremony to their cosy indoor reception underneath strings of glowing fairy lights, we loved helping these guys deck out their day with our classic walnut bentwood chairs and rattan charger plates. Styled by Arctic Fox Weddings, you can find all of the gorgeous details from their day over on the Figtree Pictures blog right here. Jasmine and Jason’s island-inspired wedding took place poolside at Hillview Homestead, filled with quirky styling details, earthy natural textures and lush blooms. A selection of relaxed cocktail furniture including our Bahamas lounges, dry bars, white director stools and seagrass umbrellas were used to bring this modern tropical wedding to life in the Gold Coast hinterland. Styled by the talented team at The Events Lounge and captured by Lucas and Co Photography, find more beautiful snaps from this luxe Gold Coast celebration over on The Events Lounge blog here. Okay, so this wasn’t technically a wedding, but we fell completely in love with the modern coastal styling for the Bond University Christmas party! Our new Dune collection helped to create a coastal luxe setting using a natural palette of rattan, white and green, including our statement gazebos, modular lounges, bench ottomans and linen napkins . Taking place at the Bond Events Centre, we had an amazing team on board for this one, including Exotic Soirees, Flora and Winter and Table for Louis. See some of our favourite snaps via Grace Wriggles below. Victoria and Mac’s Gold Coast wedding began with a botanical-filled ceremony and cocktail hour in the unique surrounds of The Borrowed Nursery, with our white Soho dry bars, Soho wire stools and linen lounge furniture creating a cosy space for guests to kick off their festivities. A minimal, elegant reception then took place at beachfront Burleigh restaurant Rick Shores with a breathtaking ocean backdrop. Styled by Event Stylist & Co, find all of the incredible images over on the Figtree Pictures blog here. 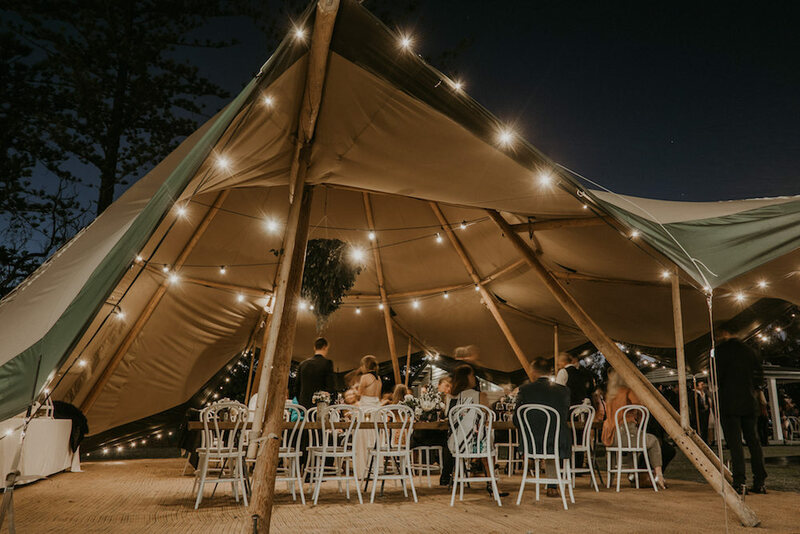 Christine and Andrew’s relaxed Tipi wedding will forever be a favourite of ours! Taking place outdoors at Riverwood Weddings in the Gold Coast hinterland, their modern bohemian setting was all about the details - from the vibrant amber glassware and elegant table settings right down to the custom bar signage, festoon lights and pastel blooms. We helped Christine and Andrew deck out their dreamy reception from beginning to end, with our walnut bentwood chairs, timber bench seats and an eclectic mix of cocktail furniture working beautifully together for an earthy, organic look. See more from their day captured by Byron Loves Fawn over on our blog right here. With unparalleled ocean views as their backdrop, Krystle and Ben’s relaxed Gold Coast wedding took place on the lawn at Kirra Hill Community Centre. Working with a fresh white and timber palette, we helped these guys create a luxe coastal setting with our white hairpin dry bars, bentwood stools, linen lounges and timber dining tables. Captured by Lucas and Co Photography, you can see more from their day (including some wedding planning tips from the bride and groom!) over on our blog here. Currently planning your Gold Coast wedding? Check out 16 of our favourite Gold Coast wedding venues here, or get in touch for a copy of our latest furniture hire catalogue. You can also find more real weddings and styling inspiration over on the blog!